Sport Minister Hugh Robertson has said that the government will suspend the much-dreaded Games lanes if traffic becomes gridlocked. 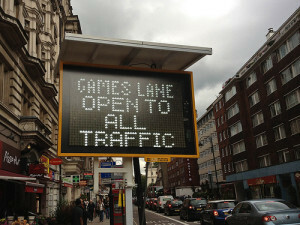 The Games lanes across London which form part of the Olympic Route Network (ORN) have provided much of the speculation about how London will cope with the Olympics. TfL rejected a report earlier this year which said that the city faced a 'perfect traffic storm', while delivery schedules have been put on a night shift. TfL have also been urging motorists to keep away for the last couple of weeks. The definition of 'gridlocked' remains unexplained — arguably, many parts of London are gridlocked on a regular basis anyway. We also wouldn't like to be in the shoes of the person who has to make the call to open up the Games lanes to ordinary traffic. Imagine the hoohaa if an athlete or (God forbid) a sponsor VIP got held up en route? We suspect that the lanes might be suspended about as many times as the Dartford Crossing tolls have been suspended in the Highways Agency trial. Some examples of baffling signage around the lanes has also been highlighted — look at this picture and decide whether you'd want to risk a bus lane fine or an ORN fine. It goes without saying that if you don't need to drive into central London during the Olympics and Paralympics then you really shouldn't do it. If it's unavoidable, check TfL's website for routes and hotspots. Anyone driving into London on the newly-reopened M4 should also remember that the bus lane is back in operation for the duration of the Games from Monday 16 July. We provided our own version of travel advice last week which can be boiled down to one word — don't. Photo by secretlondon123 in the Londonist Flickr pool.